PM: Fiscal Cliff worries behind us? Stocks were flat on the last trading day of the month. The 50dma is providing overhead resistance and breaking through this level should be met with skepticism. We’ve come a long way and it wouldn’t be surprising to see the market pullback some. 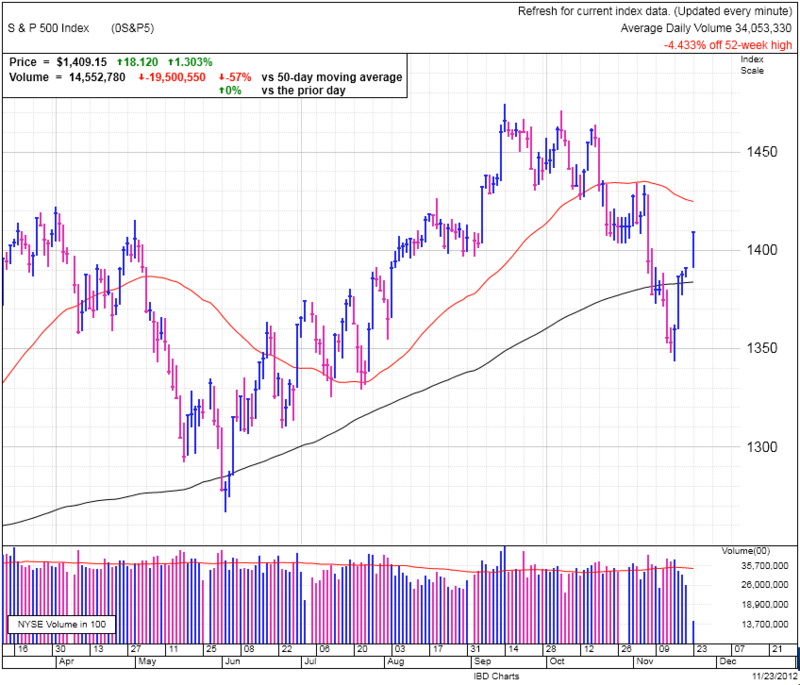 Stocks entered a holding pattern on the last day of the month. We ended virtually unchanged on higher volume as portfolio managers adjusted their positions for month-end. The last 10-minutes provided some excitement as the market surged higher, trying to breakout, only to give back most of those gains in the final 5-minutes. Portfolio managers and index funds make their trades in the final minutes of the day and their jockeying made for those last-minute fireworks. Technically we are still under the 50dma and it is providing overhead resistance. The 50dma is a widely followed technical indicator and breaking through could trigger a wave of short-covering and breakout buying since many traders follow the same technical trading philosophy. But given how far we’ve come, I would be suspicious of any breakout rally and recommend waiting a couple of days to confirm it is the real thing. Sentiment wise it seems like a lot of the fear of the Fiscal Cliff has evaporated. A couple of weeks ago the market was selling off as politicians extended olive branches to each other, and now we are rallying as they use press conferences to throw barbs at each other. A bit odd if you ask me, but that is standard operating procedure for the markets. The market often looks ahead six months or more and could have already discounted the Fiscal Cliff . Or the market could be sucking in the last of the momentum buyers before the rally fizzles and reverses lower. While most of the market might cognitively acknowledge the Fiscal Cliff will eventually be resolved, the fear of the unknown can overpower rational thought and herd instinct compounds these impulses. As humans we fear risk about 2.5 times more than a similar reward and this is why the stock market sells first and asks questions later. Are we on the verge of something like we saw in the summer of 2010 and again this summer? I don’t think so because those two cases started from a level of high complacency after big rallies. We have sold off since September and sentiment is already fairly low. The market could get spooked by a bad headline out of Washington, but it should find a floor fairly quickly. We could easily break the 200dma again and even challenge the recent 1343 low. But don’t count on going lower than that. Another scenario is pessimism is already elevated and the Fiscal Cliff worries over the last couple weeks scared off all the emotional traders, meaning there are very few sellers left to spook out of the market. In that case we could continue rallying into the end of the year. The easy trade is if market plunges on Monday. The harder read is if we pop above the 50dma. That could be the last gasp of this rally, or it could be a continuation move and the rally resumes. Short-squeezes are very short-lived phenomena and within a couple of days we’ll know if a break above the 50dma is going to stick. If it can’t hold, expect a selloff through the 200dma. If the breakout sticks, the market doesn’t want to sell off and the smart trade is buying and holding on. Surprisingly AAPL was left out of the broad markets recovery today and it finished off 0.7%. Under normal circumstances this would be a red flag, but we might give AAPL the benefit of the doubt today simply because it is the most widely held stock and month-end window-dressing could be part of today’s weakness. 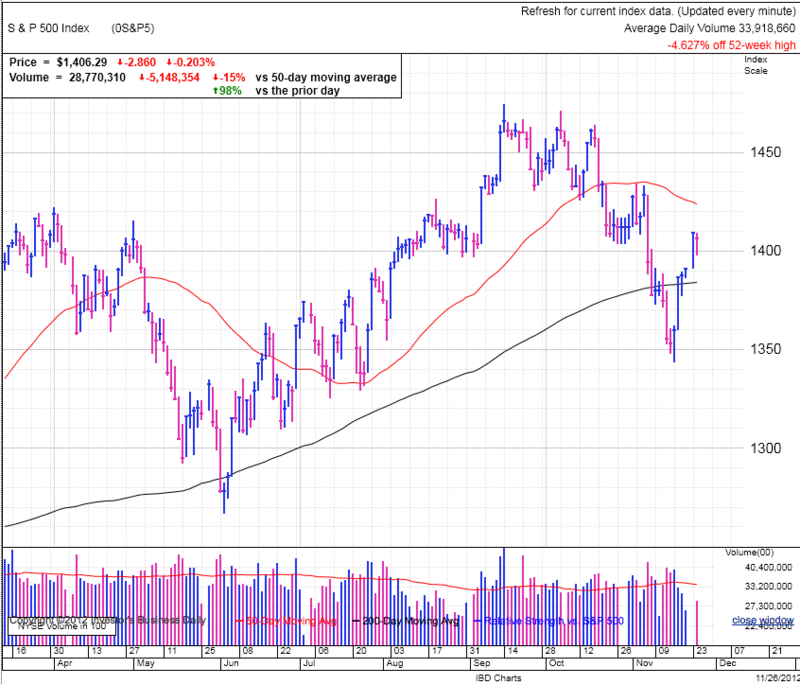 AAPL has rallied a good ways from the November 16th low and broad market weakness could push the stock down again. Hold off buying AAPL for the time being because you might get a better opportunity over the next couple weeks. November 26th, 2012 “The trend is lower and the trend is more likely to continue than reverse, so we should plan for further weakness. But at the same time, bears are getting pretty aggressive and we might see a short-squeeze thrown in before heading lower just to keep things entertaining. The market doesn’t like to be predictable and a short-squeeze before plunging lower would zing both sides and humiliate everyone equally. 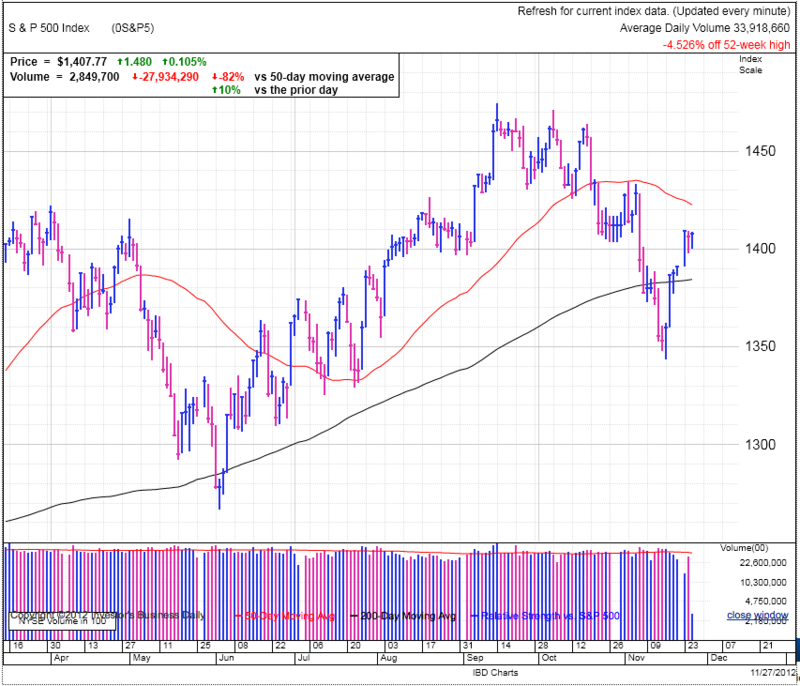 Markets trading sideways today as the market is looking for direction. The recent rally used up a lot of the bull’s ammunition and we should be on the lookout for reinvigorated bears to take back some of those gains. Stocks are trading modestly lower this morning. There is not any big new and the market is digesting recent gains. We’ve come a long way from the panic driven selloff to 1350 where everyone expected the world to implode between Obama’s reelection and the impending Fiscal Plunge. In a couple weeks we went from the world ending to everything is going to work itself out just fine. Funny how bipolar the markets can be. While most people are frustrated with this behavior, the savvy trader exploits these emotions for quick profits. Right now the market is approaching complacency, anticipating the two parties will work this deal out. It is also assuming a plunge off the Fiscal Cliff might not be such a scary thing because the ‘Cliff’ really is a gentle bunny-hill that takes a full year to fall down. The thinking is that even if we fall off the cliff, there will be plenty of time to continue negotiations and retroactively unwind the any tax and spending implications. And while that analysis is spot on, it assumes the market will be perfectly rational when the financial press starts screaming we are about to fall off the cliff. What we have here isn’t a serious structural problem, but a one of irrational fear. And that is exactly what I am hoping for. It is impossible to consistently make money off of a rational and efficient market, we need emotional market cracks to exploit and the a breakdown in talks between Democrats and Republicans will do that. Last week the two parties were open to compromise, but that was an unspecified compromise. Now that both sides are getting into actual numbers, they are realizing just how far apart they really are and neither side is willing to compromise enough to meet the other side. It will happen eventually, I have no doubt about that, but each side is going to follow the negotiation handbook first and that includes making unreasonable demands and walking away. We are on the verge of this unreasonable demands and walking away part and that will no doubt spook the market, letting the air out of this optimistic rally. It is a given these negotiations will blow up at some point, the question is when. Will it be this weekend? Will it be closer to the deadline? Or are both sides so sensitive and considerate of the stock market that they will work together and push through a deal without all the bickering. Ha, ya right! There is some sizable downside risk in the near-term for the trader, but for the investor this will just be a blip it should be easy to hold through. The experienced and savvy trader can look for a good shorting entry point. There is risk of one more short squeeze if we push through the 50dma on more conciliatory talks out of Washington. On the other side there is the profit potential of a 30+ point slide lower as talks breakdown. At this point it is up to the individual trader to decide how much risk they are willing to accept and if they want to get in early or take the safer route and get in a little late. For the investor, get your wish-list out and wait for the inevitable breakdown and let prices fall to more attractive levels. Everyone’s favorite AAPL is feeling the broad market’s weakness but at a rate 3.5x the market, down 0.7% to the markets 0.2%. AAPL is surprisingly volatile for the most valuable company in the world. Given the high-beta trade of AAPL, it no longer makes for a safe-haven in turbulent markets and wary investors should look for other places to hide their cash. But beta cuts both ways and AAPL will be an attractive buy when the market bounces back. PM: Buy or sell the breakout? Markets notched a new high for the rally as we approached the 50dma. Bears are becoming an endangered species as the bulls continue running them off. But one of the more powerful paradoxes in the markets is the smaller a group gets, the stronger they become. Expect the remaining bears to make themselves herd in coming days. 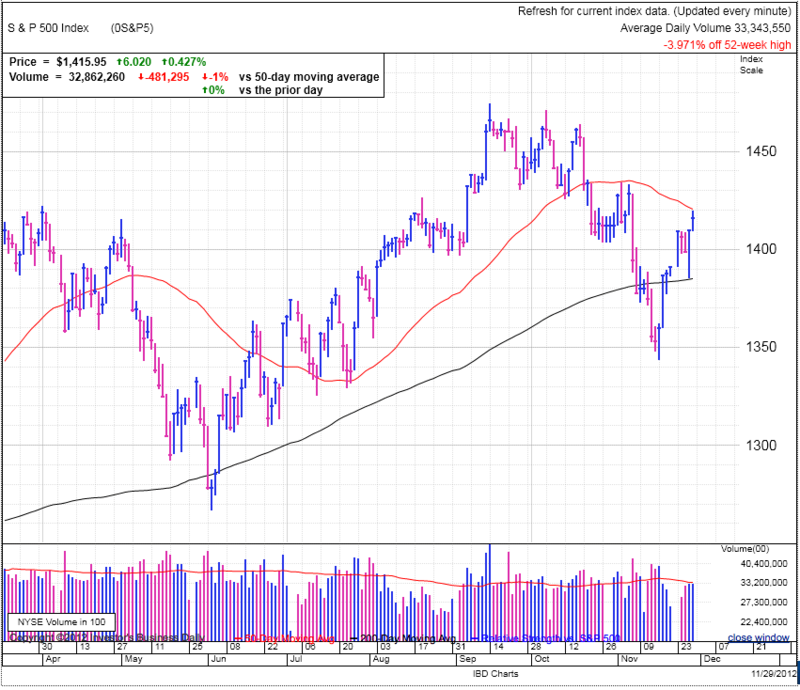 The market finally cleared 1410 and rose to the 50dma before settling back to 1415. Volume was average and the masses were not rushing to buy this breakout. Boehner caused a dip in early trade during a press conference when he said the sides were not close to a deal. Stocks have come a long way in a couple of weeks as optimism of an imminent deal boiled over, but is this time for the pendulum of sentiment to swing back the other way? Stocks have been rallying nonstop regardless of the news. Bad news might cause stocks to sell off momentarily, but within an hour they rally back. That’s what happened with Reed’s comments a couple of days ago and Boehner’s comments today. This is a Teflon market as it shakes off anything and everything. Does that make it a safe time to buy, or is the perceived safety making it even more dangerous? Bears have gotten chased out for the umpteenth time and are starting to get discouraged. Markets will often feign a reversal a couple of times before actually going through with it. Given the recent whipsaws, we are getting close to that real reversal. Many of the buyers have bought and most of the shorts have been squeezed out. Without a new catalyst, we will run out of buyers shortly. There might be enough gas in the tank for one push higher through the 50dma, but don’t expect our politicians to pretend to get along for much longer. Maybe we’ll poke our head above the 50dma tomorrow, or maybe we’ll finally breakdown. There has been a lot of hope built in to this rally that the Fiscal Cliff will be resolved early. But this is nothing more than wishful thinking, as anyone who regularly follows national politics will tell you. These negotiations will get far worse before they get better and the rhetoric will only get louder as both sides try to court public opinion. This is a good time to lighten up on stocks because not much upside remains without a definitive Fiscal Cliff deal. At the same time there is plenty of downside risk if talks breakdown. Friday might be a good day to try out a short because the weekend will give extra time for some politician to stick his foot in his mouth and wreck the fragile hope something constructive will come out of Washington. AAPL is riding along on the Fiscal Cliff rollercoaster like everything else in the market, albeit with a little more beta. There is hope AAPL will declare a special dividend because of the impending tax changes, but I wouldn’t hold my breath on that one. This segment recaps past blog posts to see how I did. Bears tried again to break this market but this rally is stronger than most expect. But don’t let this support lull us into complacency. Each failed breakdown brings us one step closer to the one that sticks. As an added bonus, at the end of this post I highlighted some of my analysis from a couple weeks ago. 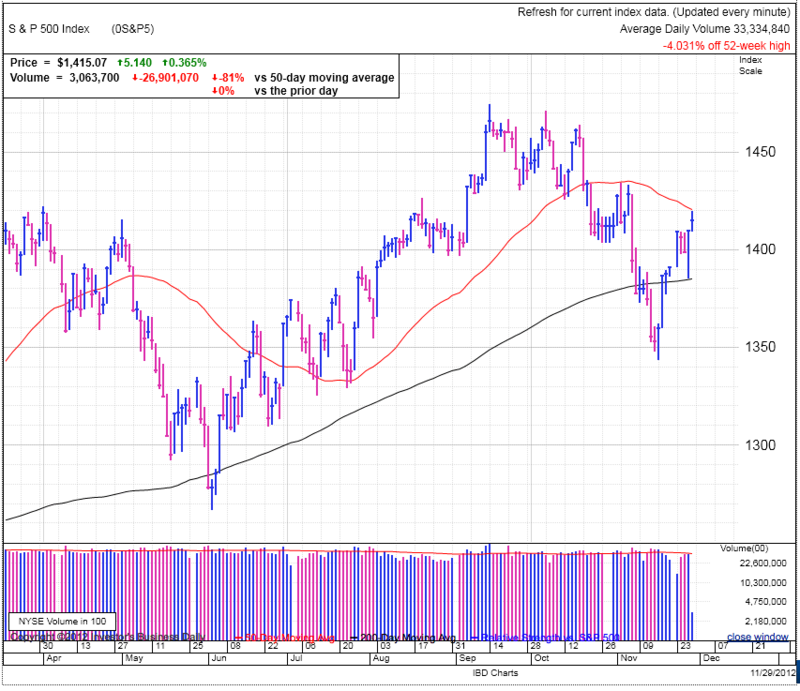 Markets opened higher and traded up to the 50dma. Then Boehner held a press conference, spooking the market and it gave back all those gains in a matter of seconds. But like we’ve seen over the last couple weeks, the market bounced back from the initial knee-jerk reaction. As seen from recent price action, the market remains emotional and we should anticipate elevated volatility in the coming weeks. But this is a good thing; a perfectly rational market is an efficient market. It is these emotional swings that present us with the best profit opportunities. Other people’s pain is our gain. I hear a lot of traders complain that politicians are driving this market. But the truth is only supply and demand can move markets. Politicians are not moving markets, emotional traders hanging on every utterance in DC is what is causing these wild swings. If traders don’t like how the market is behaving, they only have to go as far as the closest mirror to see exactly who is responsible. A couple of days ago it was Reed’s fault the market sold off. Today it was Boehner’s. The truth is it doesn’t matter. Bears were looking for an excuse to lean into the market, the got it, and they tried their hardest to break this market. But much to their disappointment, no one else followed their lead and the market bounced back. But with each failed breakdown, we are that much closer to the one that will really work. So rather than grow increasingly complacent with each rebound, we need to grow more suspicious. Lighten up long positions and get ready for the short that is getting closer by the day. AAPL is holding up nicely along side the broad markets. The nonstop selloff has been abated, but it needs to rally a few dollars more to retake the widely watched 200dma. But at this point the ‘death-cross’ is all but inevitable as the 50dma is quickly racing toward the 200dma. While a lot of people will make not of this, it is a trailing indicator and it is really late to this party. More than a selling signal, any weakness on the ‘death-cross’ could be a buying opportunity. I’ve been sharing a lot of ideas on this blog and I want to start this scorecard feature to highlight my successes and failures. Bears got taken to the woodshed today were bloodied yet again. Many of the value investors who were accumulating shares over the last few weeks are comfortable and confident with their positions and their discipline prevented a wider emotional selloff. The selloff is coming, just not yet. It was a big day in the markets with a 25-point swing between the high and low. In the first hour of trade it looked like the market was breaking down, but the selloff ended just as quick and the subsequent rally continued through the day. We finished higher by 0.8% and regained the highs of this recent rally. It was a bad day to be short and this was clearly a bear trap that snared a lot of pessimists. As I mentioned on Tuesday, this was the wrong time to be short the market. There is nothing wrong with taking profits here, but it is a little early to be jumping on the short bandwagon. Volume was just a hair under average and similar to what we saw on Tuesday. The relatively modest volume showed that while this was a wild ride, not a lot of people were sucked in by the apparent breakdown or subsequent reversal. This further reinforces the idea that many of the buyers over the last few weeks are confident and prepared to hold through some volatility. Their willingness to sit tight in the face of selling pressure is what constrained supply and lead to the bounce. Yesterday I talked about how all the selloffs in the last 5 years were great buying opportunities. Obviously this isn’t always the case, so how do we tell the difference between a buyable dip and the start of a bear market? It all comes down to what other traders think. Right now everyone is obsessed with the Fiscal Cliff and all the other negative headlines out there. It is this widespread negativity that shows we are still in a bull market. Compare this to the spring of 2008 after the market already sold off from the 2007 highs. Even then complacency was the norm as everyone was used to easy money and viewed the market as an attractive buy. At the time Obama and Hillary were fighting for the Democratic nomination and in the process were trashing Bush and the economy. Investors took a lot of offense to Hillary and Obama suggesting we were entering a recession. In fact the candidates were so widely criticized for spooking people that they started referring to it as the “R-word” so everyone would back off. Obviously Hillary and Obama were simply making political hay and had no idea what was about to unfold, but that obliviousness by everyone is exactly what set the stage for a major selloff. The question we have to ask in the present day is if traders are complacent and oblivious to the risks in front of us. Not only are investors in tune with the risks in the world, so is the average Joe. This doesn’t mean we won’t have volatility and selloffs, but those selloffs are buying opportunities, not a time to head for the hills. Given how badly the 2008 selloff damaged the average investor’s psyche, I think it will be years before we see widespread complacency lead to a major bear market. Given the strong reversal today, the 50dma is within easy reach and the bigger question is whether we will break through it or hit our heads. The market is sensitive to headlines and the building expectations of a Fiscal Cliff resolution are setting the stage for disappointment as negotiations drag on. While the Fiscal Cliff is not as big of a deal as other crisis in recent memory, it will be enough to spook emotional traders and present an attractive profit opportunity for a savvy trader willing to go against the grain. In the near-term look for the market to rally a bit more before pulling back. The selloff will be swift and decisive, but it will find support after breaking the 200dma and 1400. I’m not a psychic and can’t predict if we’ll make new lows or not. But if we take our profits early, it really doesn’t matter. The more important trade will be buying this Fiscal Cliff selloff and getting ready for the inevitable bounce. 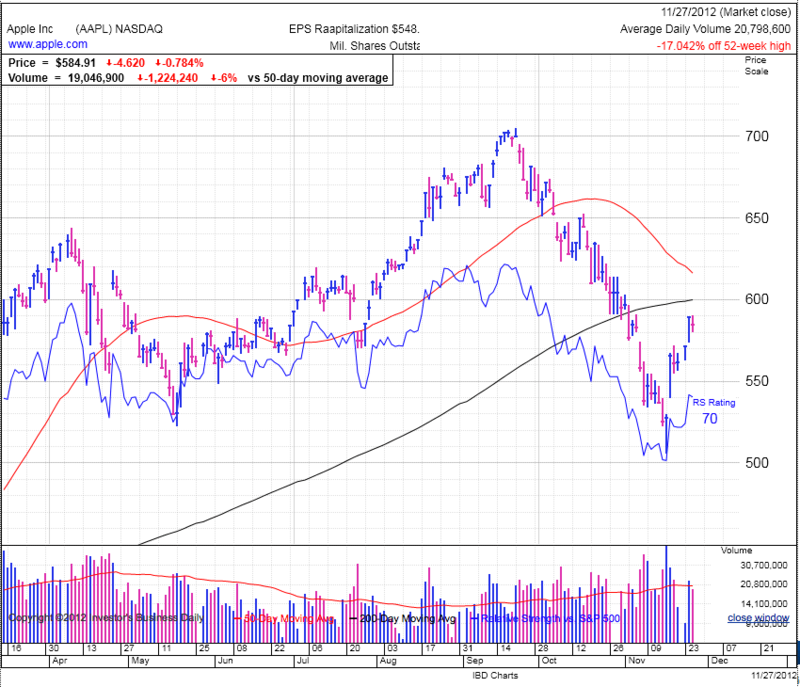 AAPL is trading sideways and consolidating recent gains after bouncing off of the $500 level. What was the must have stock became the must short stock. It worked if you were daring enough to get in, but this stock is too much of a darling to not bounce hard when the price declines this much. No matter what the fundamentals show, many traders are infatuated with AAPL and will buy it all the way down. As for the fundamentals, I have yet to see a young person with an iPhone5. The Samsung Galaxy SIII is the new cool kid on the block and I’ve seen far more of those than iPhone5s. No doubt there are a lot of soccer moms who still lust for an iPhone5, but the days of undisputed rule are coming to an end. AAPL makes a great product, but expect competition to hammer market share and profit margins in coming years. Of course this is a longer viewed prognosis and in the near-term the emotional volatility surrounding AAPL will make for some great swing trading. Bulls are eating bear lunch today as the market bounced smartly off of the 200dma on a failed selloff. The market will selloff, just not yet. 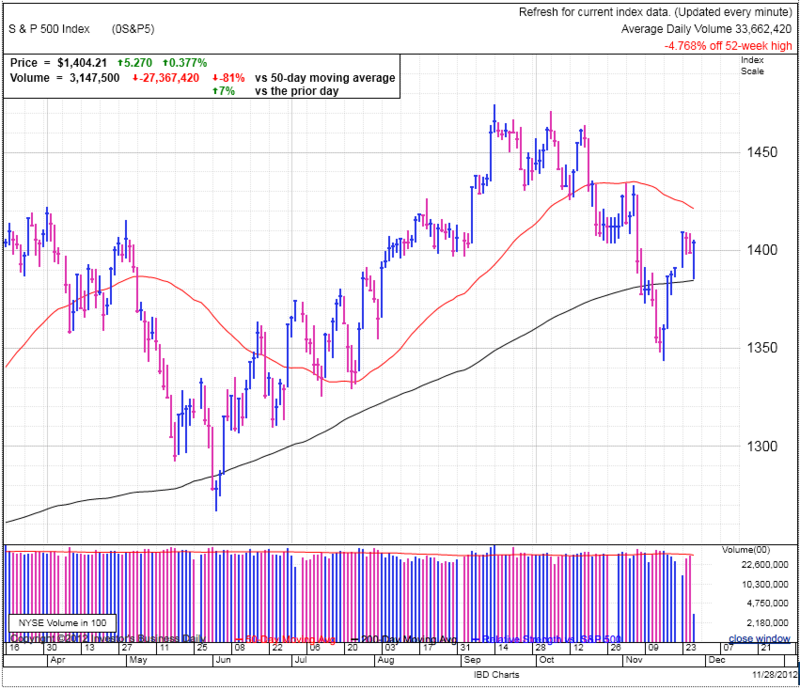 The markets attempted a selloff in the first hour of trade, but rebounded just as sharply after getting close to the 200dma. The market tried a second selloff during an Obama press conference, but the market bounced back and is now trading in the green. Clearly there are people trying to takeout this market, but the market is unwilling to go along and bounces back each time. All is not well with the world, but you have to respect the market’s resilience here. Little doubt this early selloff seduced many bears into jumping on the short bandwagon, but this quick rebound shows the market is not ready to selloff yet. The short trade isn’t working because it is failing to trigger wider selling by other holders. The recent dip to 1350 shook out most of the weak holders and the current crop of owners is more comfortable holding and less likely spooked out of the market. In addition, these recent shorts are creating the fuel for yet another short-squeeze. All of this makes for a tough short. A pullback is in our future, the market just isn’t ready yet and we have to respect this supportive price action. This is a perfectly acceptable place to take some long profits off the table, but it is still a little too early to short the market as many bears are finding out….yet again. While I expect we might see more upside here, the risk/reward is not very favorable for owning stocks here. There is limited upside remaining in this move accompanied by quite a bit of downside exposure. But this is just for the short-term trader. Medium- to long-term traders should expect some near-term volatility but will be rewarded for sitting through it. AAPL is turning into a high-beta proxy for the markets. It saw the same early selloff but is now at the day’s highs, although not quite in the green. A little retracement here is a good thing because the recent run was a little aggressive and unsustainable. Some churn here makes the rebound more likely to stick. Markets traded lower and finished at the bottom of the day’s range, just a tad under 1400. Is this the break bears were looking for, or just a bear-trap to snare all the eager top-pickers? Volume was a tad under average, but picked up significantly from Monday’s sluggish levels. We are between the 200 and 50dma and a hair under support at 1400, a key level dating back to August. We still have a way to go before breaking the trend of lower highs, the last high being 1434. No doubt today’s declining price tempted many chronic bears to re-short the market. Maybe they will be proven right, or maybe they are early, only time will tell. Honestly it can go either way here, but usually when all else is equal, you are better off siding with a continuation. The market was spooked on some commentary out of D.C. about lack of progress and that was enough to send a shutter through the markets. But any intelligent investor needs to recognize this is boilerplate political negotiation conducted through the media. Expect it, trade it, profit from it. We are still early in the negotiation process and I expect today’s issues will quickly be ironed out. It won’t be until closer to the deadline where we will encounter seemingly fatalistic breakdowns that will send the market materially lower. Heck we might even go over the proverbial Fiscal Cliff when Republicans and Democrats can’t agree on what exactly what revenue increases and cost cutting looks like. But that is just our elected officials playing a high stakes game of chicken. If you can’t stomach that turmoil, then maybe you need to find another hobby. Every single catastrophic selloff in the last five years has been a buying opportunity. The 2008 financial meltdown came and went. Euro Contagion has blown over a couple of times already. The Fiscal Cliff Part I came and went. Even a downgrade of US Debt was a buying opportunity. And this time will be no different. Now some people will say buying prior to these events exposed people to a lot of risk and heartache. But that is buying before the worry sets in. We are well past complacency and everyone is already fretting over every interview with politicians or central bankers. Fear complacency not headlines. Now this is a longer view, in the near term we probably need to whip around a bit before this is done. And that is a good thing. It is the other traders who cannot control their emotion that give us the best profit opportunities. Seeing how we ran up nearly 5% last week, a modest but dramatic pullback is in order. Maybe it will start tomorrow, or maybe next week. As for all the ‘tax selling’ going on in the markets anticipating tax hikes next year, all this money coming out of the markets will need to find a home next year. Selling now is buying later, just another catalyst for a continued rally next year. AAPL is rising from the grave. This is obviously a stock that is swinging dramatically from an imbalance in supply and demand. In September it was over owned around the iPhone5 launch and more recently the huge wave of selling was overdone. In all reality the big run is probably coming to an end and it is changing from a buy and hold stock to a trading stock. FB is also showing life after being left for dead with all they shares that were supposedly going to hit the market after the lockup expiring. Funny how the day that the stock was supposed to crater it went up huge. Proof again conventional wisdom doesn’t work so well in the markets. I’m experimenting with posting twice a day, once during the trading day and another in the evening. This will let me share ideas midday while there is still time left to make a trade and again in the evening to help digest all the day’s action. Stocks are churning above 1400 and in the green at midday as traders demonstrate willingness to buy and hold at these levels. We are finding support as tentative optimism over a Fiscal Cliff compromise persist. No doubt cynical bears are leaning into the is market again, but the market is holding up for the time being. Bears putting on new shorts are creating the fuel for what could turn into one more short-squeeze. It all comes down to how many new buyers can be tempted to wade in above 1400. We’re working on our 6th close above the 200dma and 3rd close above 1400. The longer we hold here, the more tempted people will be to buy. Of course the irony is their confidence is what will ultimately undo this rally. Once they are done buying, demand will dry up, and we’ll selloff. There is always news in the world, both good and bad. Right now the market is gravitating to the good news and ignoring the bad. It helps that our politicians appreciate the importance of perception and are doing their best to make it look like they are working toward a compromise. Of course it also helps that we are at the early stages of the negotiations and it is easy to agree in principle But the devil is in the details and we should expect some major wrenches in the works when the negotiations move into the finer details. A major snag is what could trigger the next round of selling. I still think there might be a little more upside left in this move, so wait a little longer before putting on a short position. But we are getting close to the end of this run and longs should start looking to lighten up. Of course this is directed toward the swing traders, longer viewed investors can continue holding, just expect some near-term volatility and be prepared for another dip before all of this is resolved. 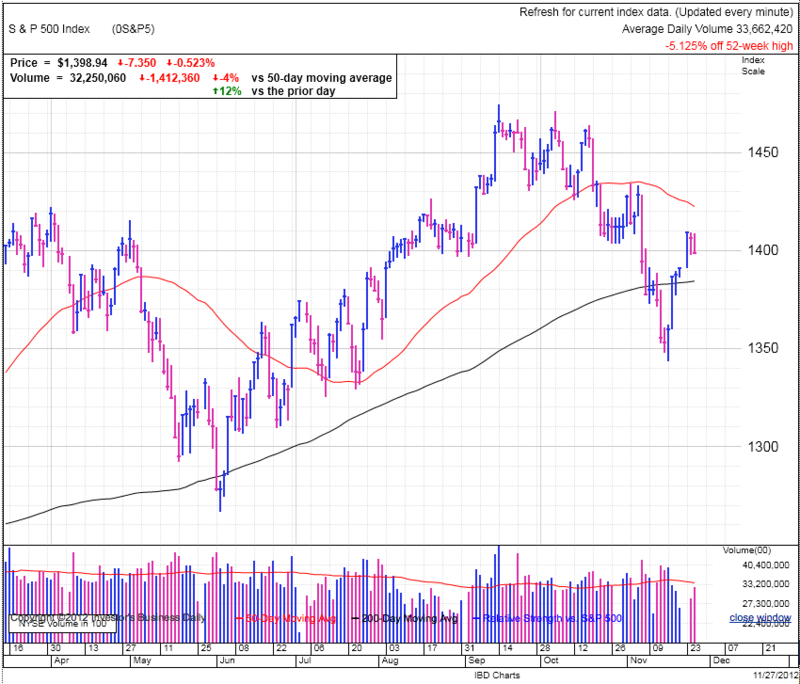 Markets finding support after last week’s sharp rally, but how long can this keep up? Maybe the more important question, is wise to holdout for those last few dollars? It was an interesting day in the markets. Initially the market sold off, but it found support and finished near the day’s high, although still in negative territory. AAPL made a huge comeback and no doubt contributed to some of the tech market’s strength. Today’s volume was below average, but not surprising being the first trading day back from the holiday weekend. Today markets the 5th consecutive day above the 200dma and it seems the worst fears of careening off the fiscal cliff have dissipated. Of course this rally creates room for another bout of pessimism to take hold. It is pretty obvious we’ve come a long way in a short amount of time. The speed of the bounce has not allowed many people to change sides and we still have a fair number of bears gunning for the markets even if they were chased out in last week’s short squeeze. Where we head from here largely depends on how other people are positioned. There are still a lot of bears out there, but many of them were chased out of their shorts last week, meaning they have renewed ammunition to use against the market. 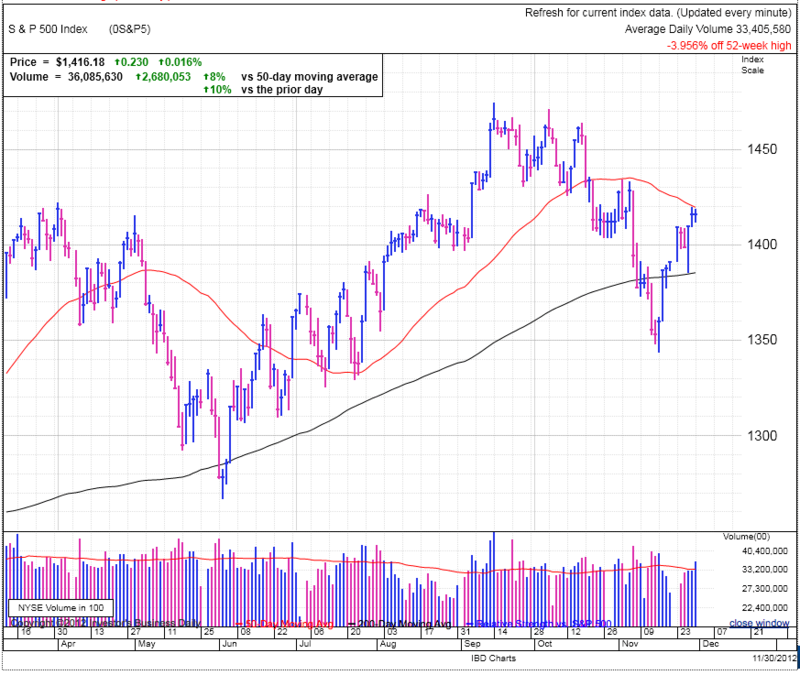 We also had some momentum buyers jump on board the break above the 200dma and 1400 resistance/support. Momentum buyers are a fickle group and will bail at the first hint of trouble. Both of these factors point to selling pressure in the near future, but the counter argument is these things often go further and longer than most expect. Combining those two ideas, we might expect a little more upside before this bounce runs out of steam. As I shared last week, we are close to the end of this move, but I would like to see one last push higher before rolling over. I thought we might get that at the open and that would have made for a great exit/short. But opening lower makes it more likely we might see one last push higher before rolling over. Of course debating a little higher or simply lower is nothing more than trying to pick a top and gambling at best. We need to accept that we can never sell the top and it is foolish to try. Either we intentionally choose to sell early, or the market forces us to sell late. A case can be made for each, but personally I prefer selling early because it is far less stressful to be in cash. Holding temps brings out the emotions greed and regret. When I’m in cash, it keeps my head clear, allowing me to identify and pounce on the next opportunity. I’ll always miss some upside, but I’m okay with that because it means I will be in a better position for the next move. The goal isn’t to make all the money, only the easy stuff. Leave the rest to the gamblers. More often I find people who think it is better to sell late because the logic is you capture the entire move and leave the door open to an extended run higher. And don’t get me wrong, I understand the logic behind the idea. But in reality it works less well in practice because human emotions of greed and regret get in the way when trying to sell something on the way down. We start obsessing about what we could have sold it at just a couple of days ago. Then we are tempted to wait for it to come back. If it comes back, greed kicks in and instead of selling we decide to hold a bit longer. If it falls again, we convince ourselves this is just a minor dip and it will continue higher if we just wait a little longer. I know because I’ve been there. The beauty of selling early is you don’t have any of those doubts. And the proof is in the pudding. I’ve read countless interviews with successful traders and virtually all of them claim a major key to their success is selling too early. In fact, I can’t recall a single one that said he prefers to sell on the way down. Like many aspects of trading, this is an individual decision and you should stick what gives you the most success. Really strong rally on the abbreviated, post-Thanks Giving trading session. Obviously volume was ridiculously light, but it was real money exchanging hands and low volume profits are just as real as their higher volume counterparts. I didn’t expect today’s strong rally, but at the same time it didn’t surprise me either. The press is attributing it to strong Black Friday sales, but that is baloney. All of the decision makers were out of the office and today’s trade was nothing more than tripping autopilot buy orders. Most of them were stop-losses from shorts, but there were also some breakout buying as we easily cleared resistance at 1400. But rather than traders sitting in front to their screens making decisions to buy or sell, last week traders placed tripwires above and below the market as a risk management technique to prevent them from being caught with their pants down while they were on vacation. The thing we have to be wary of with today’s trade is people are not as committed to these gains because most didn’t actively chose to buy these levels. Instead it was automated risk management that triggered this pop. Shorts were protecting against larger losses and longs were buying the breakout so they don’t risk being left behind. This setup makes for an awfully fragile rally and we covered a ton of ground in five trading sessions. There is no way the rate of this rally, mostly driven by a short squeezes, can continue. The point of maximum pain for shorts is where the market will peak and turn lower. Decisively breaking 1,400 could be that point. Or we could regain all the post-election selloff and test the 50dma to fully humiliate bears before turning lower. But either way we are far closer to the end of this thing than the start. Longs should lighten up after this strong run. It is possible we’ll see a little follow-on buying when the market opens on Monday, but the smart money is taking profits here, not buying the breakout. The goal isn’t to top tick the market, but to make the easy money and let someone else shoot themselves in the foot by holding too long. We’re currently in a swing trader’s market as the pendulum swings back and forth between bears and bulls. Expect some turbulence in the near-term intended to demoralize both bears and bulls before the market finally reveals its true intentions. I expect a continuation of the current bull market because there is nothing new and unexpected lying in front of us. It is the fear of the known, not the unknown, that presents the best profit opportunities for the savvy trader. Everyone already knows about the Fiscal Cliff, Debt Ceiling, European Debt Crisis, Middle East conflicts, and slowing China. The fact that everyone is already talking about, even obsessing about these issues means we can safely ignore them. Their fear is our profit opportunity and it is the crowd’s reluctance to buy that creates the asymmetric trade. For the time being, lock-in swing trading profits and anticipate for the impending pullback. But over the medium term, plan for an upside breakout from this consolidation.